Buddhist culture is exemplified through Buddhist art, Buddhist architecture, Buddhist music and Buddhist cuisine. As Buddhism expanded from the Indian subcontinent it adopted artistic and cultural elements of host countries in Asia. Buddhist art originated in the Indian subcontinent in the centuries following the life of the historical Gautama Buddha in the 6th to 5th century BCE, before evolving through its contact with other cultures and its diffusion through the rest of Asia and the world. A first, essentially Indian, aniconic phase (avoiding direct representations of the Buddha), was followed from around the 1st century CE by an iconic phase (with direct representations of the Buddha). From that time, Buddhist art diversified and evolved as it adapted to the new countries where the faith was expanding. It developed to the north through Central Asia and into Eastern Asia to form the Northern branch of Buddhist art, and to the east as far as Southeast Asia to form the Southern branch of Buddhist art. In India, Buddhist art flourished and even influenced the development of Hindu art, until Buddhism almost disappeared around the 10th century with the expansion of Hinduism and Islam. Buddhist religious architecture most notably developed in the South Asia in the third century BCE. Two types of structures are associated with early Buddhism: stupas and viharas. 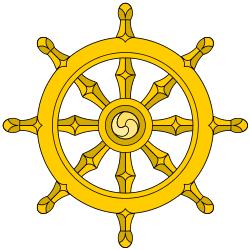 The initial function of a stupa was the veneration and safe-guarding of the relics of the Buddha. The earliest existing example of a stupa is in Sanchi (Madhya Pradesh). In accordance with changes in religious practice, stupas were gradually incorporated into chaitya-grihas (stupa halls). These reached their highpoint in the first century BCE, exemplified by the cave complexes of Ajanta and Ellora (Maharashtra). Viharas were developed to accommodate the growing and increasingly formalised Buddhist monasticism. An existing example is at Nālandā, (Bihar). Buddhist temples were developed rather later and outside South Asia, where Buddhism gradually declined from the early centuries CE onwards, though an early example is that of the Mahabodhi temple at Bodh Gaya in Bihar. Buddhist music prominently includes Honkyoku, Buddhist chant, and Shomyo. Honkyoku are the pieces of shakuhachiyoku for enlightenment and alms as early as the 13th century. Repetition of the name of Amitābha in Pure Land Buddhism. Throat singing in Tibetan Buddhist chant. Musical chanting, most often in Tibetan or Sanskrit, is an integral part of the religion. These chants are complex, often recitations of sacred texts or in celebration of various festivals. Yang chanting, performed without metrical timing, is accompanied by resonant drums and low, sustained syllables. Many ritual musical instruments are used in association with Buddhist practice including singing bowls, bells, tingsha, drums, cymbals, wind instruments and others. Buddhist cuisine is a kind of cuisine mainly for the believers of Buddhism. It is known as zhāi cài (zhāi means "purification" or "discipline", cai means "cuisine" or "vegetable") in China, and shōjin ryōri (shōjin means "devotion", ryōri means "cuisine") in Japan, and by many other names in other countries. Due to the understanding of animals as conscious and suffering beings, many Buddhists do not kill animals and many also do not eat meat (other than that from those who died naturally, and from species where the consumption of brethren is not troubling to the still living). Certain major Mahayana sutras show the Buddha forcefully denouncing meat-consumption and advocating vegetarianism (vegetarianism in Buddhism). Some Mahāyāna Buddhists in China and Vietnam also avoid eating strong-smelling plants such as onion, garlic, chives, shallot, and leek, and refer to these as wu hun (五葷, 'Five Spices'). Buddhist vegetarian chefs have become extremely creative in imitating meat using prepared wheat gluten, also known as "seitan" or "wheat meat", soy (such as tofu or tempeh), agar, and other plant products. Some of their recipes are the oldest and most-refined meat analogues in the world.